I haven't looked, but if I were a betting woman, I'd wager I've done this verse before - maybe even similarly to how I did it this time. But I need this verse - and this image of it. How often I feel the need to be scooped up in my Father's arms and protected! How often does He have to hold me like this so He can give me the rest I refuse to take of my own accord? Am I weary? Am I burdened? Often- much more than I should be. Only He can give me rest. Lovely! Great picture with that verse! What an peace and restful sight and verse! Thank God we can run into his loving arms!! Hit me again, Joanne. I needed this. Nothing like resting in our Father's arms. Thanks for this, Joanne. Joanne! LOVE this! It's just perfect! Thanks Joanne, I needed it today too. The picture stirred up in me the scripture before I scrolled down to see it. :) Dead on, my friend. Thanks for the encouragement. One of the most comforting verses in the Bible. And a perfect picture to go with it! awwwwwww, that is so worshipful. Hard to be stressed when we're resting in His arms. Lovely image of resting in the Father's love. 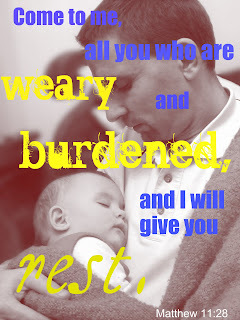 I'm going to be that baby today and nestle in closely to my Father's heart... I'm in great need of rest, sister; this move has nearly done me in from every angle. Good to hear from you and about your great accomplishments of the past month. Keep to it and finish that book so it's ready for a "pitch" very soon!